The Lord Who wrote a Divine Treatise on Meditation, titled Dhyana Vahini, with His Divine Fore vision had planted a small sapling on the idyllic hillock at the eastern side of Prasanthi Mandir five decades ago, precisely on the 29th June 1959. Bhagawan then declared that Yogis who have reached a certain stage of spiritual progress will automatically come to know of this tree and the mystic plate of inscription, materialized by Him on the Chitravati banks, and they will be drawn by the mysterious force of these toward the meditation grove which will then fully justify its name! This epochal Meditation Tree turned 53 today. 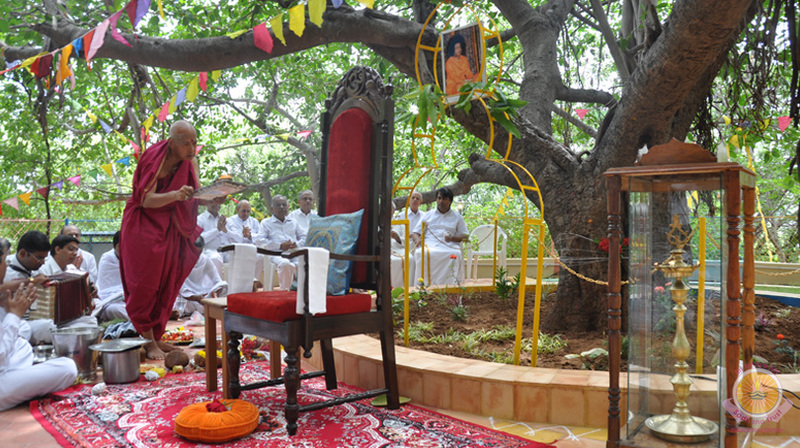 Commemorating the occasion, a function was held atop the Hill, in the Meditation Grove this morning, attended by Senior Trust Members, officials, students and devotees. With the special ritualistic offering commenced and continued close to 0930 hrs. in the morning, a steady stream of devotees arrived post Bhajans and Mangala Arathi in the Mandir, comfortably occupying slots at various vantage points upon the hill behind the grove, and the area around, watching the proceedings. After the special ‘Vruksha Puja’ even as Veda chanting by the officiating priest continued, students chanted Sai Ashtotharam that was followed by Arathi to the Tree. Three Bhajans followed, that began specially invoking Bhagawan with the particular Ashtothara Namavali referring Him to ‘Vatavriksha Pratishtapaka’, One Who planted the Meditation Tree. The programme culminated with Mangala Arathi at 10:30 hrs. Prasadam was distributed to the entire assembly. As part of the developmental plan, the first phase of facelift of this grove has been completed. Fenced around with lighting poles, the grove now has a tiled circular space around where devotees can sit and meditate, at ease. Tiled steps have been laid, leading to the grove from the road, and facilitating wheel-chaired as well aged devotees, a tiled ramp has also been provided leading to the grove. Earlier, in an another auspicious function held in the morning, the Gopuram gate entrance got an enhancement par excellence when a statue of Lord Ganesha was installed this morning welcoming the devotees to Prasanthi Nilayam. The rituals started at 1900 hrs. last evening, the 28th of June 2012. After the Kalasa Stapana, a variety of Homams including the Sthala Shudhi Homam, Navagraha Homam, Ganapathi Homam etc., were performed. The idol and the kalasa which will adorn the top of the shrine were then immersed in sacred water before being installed in their sanctified positions. At 0530 hrs., to the sounds of Panchavadyam and Vedic invocations, the veil was removed and devotees assembled were advised to have Darshan of the Lord through a mirror placed in front of the shrine before looking at the idol directly. The Poornahuti of the homams performed the previous day was then conducted with all auspiciousness. The event was then paused as the the nagarasankirtan passed by sanctifying the atmosphere with the most powerful energy, the sound of the Divine Name. The ritwiks then consecrated the Kalasam with worship and ablutions before shifting their attentions to the Master of the Mind Who sits atop the restless senses whose effect He has reduced to the size of a mouse. The Elephant Faced One, the Rider of the mouse Mushika, the Remover of Obstacles, the Auspicious One who is always worshipped first, Lord Ganesha was then lovingly bathed in a variety of traditional items including milk, honey, fruits, tender coconut and so on before being adorned with floral garlands, sandal and vermilion. As part of the ritual, Go Puja was done to a pair of cow and calf brought from Sri Sathya Sai Gokulam. Mangala Arati was then offered to the most beautiful form. One could not but recollect the various festivals, functions, events and even simple loving interactions that this particular form has witnessed when placed in the Sai Kulwant Hall, adorning the backdrop of the Seat Of The Divine! Prasadam including Sweet Pongal and modak were offered to all assembled on the occasion. Later, in the morning at around 0815 hrs., a new exit gate next to the existing Ganesh gate, opposite Chitravati Road, was inaugurated for the convenience of devotees who exit Ashram by foot. The short ceremony was marked with lighting the lamp and breaking of coconuts. In the evening, announcement was made on the Ashadi Ekadashi programme, scheduled for tomorrow morning. The Dindi procession will march into the Sai Kulwant Hall at 8:20 am that will be followed by a Dance offering, depicting Ganapathi by the Nasik group of devotees. A dance drama entitled “Master The Mind, Be A Mastermind” will follow next, staged by the Youth of Mumbai. In the evening Sri Geet Sagar & Team will offering at Bhagawan’s Lotus Feet. Celebrating auspicious Ashadi Ekadashi, devotees from Maharashtra & Goa presented a colourful morning studded with Dindi Procession, Ganapathi Dance and a Dance Drama entitled Master The Mind Be A Master Mind, today in Prasanthi Nilayam. The programme commenced at 0830 hrs., after half-an-hour Veda chanting. Symbolic to the age-old tradition of Varkari Yatra to Pandharpur, Abode Of Lord Vitthala, hundreds of devotees have arrived last evening after their Dindi Yatra from Dharmavaram. Commencing the proceedings men dressed up in typical Maratha style, blowing the conch, carrying the Palanquin Of Lord Vitthala marched into Sai Kulwant Hall, presenting themselves to Bhagawan at the Sanctum Sanctorum. Even as they marched with measured gait, in the backdrop echoed the captivating, enchanting tune of famous Marati song, Hey Oh Vitthale Bhakta Jana Vatsaley…, singing paens of the Lord Of Pandharpur. A colour pageantry of Ganapathi Dance by the Youth from Nasik followed invoking the Lord Who has no Over Lord, as discoursed by Bhagawan Himself. Next to come was a Dance Drama entitled Master The Mind Be A Master Mind by the Bal Vikas children of Mumbai along with the tiny tots from Sri Sathya Sai Vidya Mandir, Dharmakshetra. The presentation portrayed the plight of modern day man, who is confused, caught up by devilish mind, seeking the ephemeral, dooming himself to perdition. When the illusory mind dies, or is killed, light dawns upon him as Intellectual Wisdom prevails upon making him realise that ‘he is in essence Eternal Atma and not the body as he is often deluded to believe. The protagonists transformation from a man trapped in the vagaries of his wretched mind to a man of greater understanding and intellectual wisdom to finally, into an intense seeker was well portrayed bringing lively scenes from normal day-to-day worldly life. Towards the end, as the protagonist turned towards Bhagawan surrendering himself, tiny tots burst into a colourful dance singing Badhai Ho…Badhai Ho...meaning congratulations! Hailing Beloved Bhagawan, these tiny tots affirmed with greater faith that something extra-ordinary in the history of mankind is in the offing. The presentation was interlaced with colour dance sequences. The same theme was presented before Bhagawan during one of His sojourns to the city. Bhajans by the Maharashtra & Goa devotees followed before Mangala Arathi at 10:00 hrs. All the participants were gifted with special presentations and Prasadam was distributed to the entire assemblage. In the evening, upcoming singer Geet Sagar and troupe will present a Musical Bouquet at the Sanctum Sanctorum as part of Ashadi Ekadashi celebrations. At the end of the presentation, all the artistes were felicitated and group photo was taken. Even as bhajans continued, prasadam was distributed and Mangala Arathi was offered at 1830 hrs. Earlier the evening session commenced with Veda chanting by Maharashtra & Goa group of Youth and Bal Vikas. Ashadi Ekdashi passed on and Guru Purnima is coming up. Prasanthi has always looked forward to this day as this has been the occasion when Bhagawan, The Ultimate Teacher and Cosmic Redeemer, confers benedictions upon His creation preaching on the greater significance of Guru Worship…and thus the greater import. On the sidelines of the festivity, as has been the practice, some special functions have been organised on the 2nd and 3rd of July. A National Convention of Sri Sathya Sai Parenting and Bal Vikas Teachers Training will be held on 1st and 2nd July, attended by over 300 delegates. Even as the festive-week being unfolded, a steady stream of devotees are flocking to Prasanthi Nilayam.